Born: 7 October 1847, Holitz, Bohemia, Czech Republic. Died: 21 February 1902, Vienna, Austria. Emil Holub, medical practitioner and traveller, grew up in Holitz (or Neu Holitz), Bohemia, then part of the Austrian empire and now in the Czech Republic. The town should not be confused with Holice (Holic) in present Slovakia. He developed an interest in natural history and geography in his youth and, inspired by David Livingstone's* Missionary travels and researches in South Africa (1857), decided to explore the subcontinent himself. In 1866 he began to study medicine and natural sciences at Karls-Universitaet, Prague, graduating as Doctor of Medicine (MD) in February 1872. Three months later he left for South Africa, landing in Port Elizabeth on 1 July. He made his way to the diamond fields and set up practice in a tent at Dutoitspan (now Beaconsfield in Kimberley). After earning enough money to finance a preliminary collecting expedition he set out in February 1873 with three companions, travelling mainly along the Vaal River as far as Wonderfontein, beyond Potchefstroom. There he explored the huge Wonderfontein Cave and eight years later published the first detailed description of it. During this trip he collected some 30 skeletons, 1500 plants, 3000 insects, 300 rocks and minerals, three chests of mammal and bird skins, several fish, and ethnological material. Back at Dutoitspan he rebuilt his practice to finance a second preliminary journey, which took place from November 1873 to April 1874. He visitd the Tlhaping at Taung, proceeded via present Vryburg and Mafikeng to Molepolole, and reached his northernmost point at Shoshong, west of present Mahalapye, Botswana. Here he collected large quantities of ethnological material. Upon his return he exhibited his collections at Kimberley and at Hopetown. Again he resumed his medical practice, this time to finance a more ambitious collecting trip. Setting out in March 1875 he proceeded via the Marico District and Shoshong to the Zambesi River. Across the river he visited Sesheke, the headquarters of the Barotse Chief, Sepopo. 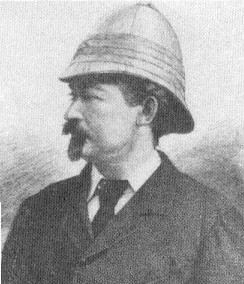 Planning to follow in Livingstone's footsteps up the Zambesi and through Angola to Luanda, he sent his collections back to Shoshong with a trader and visited the Victoria Falls. After almost two months exploring and hunting around Sesheke he began his journey up the Zambesi in a number of canoes. However, after a mere 80 km two of his boats capsized when negotiating rapids, with the loss of much of his supplies. Suffering from fever and dysentry he eventually arrived back in Kimberley in November 1876. There he exhibited his ethnographical and natural history collections, charging a small entrance fee to raise money, and built cages for the live animals he had acquired. In October 1877 Holub was elected a corresponding member of the South African Philosophical Society, which had been founded in Cape Town earlier that year. By the middle of 1878 he was ready to return to Europe with his collections. On his way to Algoa Bay he gave the first of many public lectures in Colesberg, and spent some time in Cradock. In Grahamstown he gave further lectures and made a number of sketches of the town, which he later allowed to be used as illustrations in the second edition of Thomas Sheffield's The story of the settlement (Grahamstown, 1884). After lecturing in Port Elizabeth and Cape Town he left for Europe early in August 1879. In London he read papers before the Royal Geographical Society and the Royal Colonial Institute and presented some birds and other animals to the London Zoo. The remaining animals were sent on to Prague, which he reached in October. During the next few years he gave some 200 public lectures in Europe and became a popular figure as well as a recognised authority on Africa. From May to October 1880 a selection of over 12 000 of his natural history and ethnographic specimens were exhibited in Vienna, while exhibitions were also held in Prague and elsewhere. Some 600 of his plant specimens were presented to the herbarium at Kew Gardens in 1883, and his manuscript "Pflanzenbuch" was incorporated in the Kew plant lists. The fishes that he brought back were described by Steindachner in 1894. Holub based an impressive number and variety of publications on his travels. These included papers such as "Reise in Suedafrika" (Petermanns Mitteilungen, 1876), and "Journey through Central South Africa, from the Diamond fields to the Upper Zambezi..." (Proceedings of the Royal Geographical Society, 1880). An illustrated two volume account of his travels was published in an original Czech edition (Prague, 1880-1881), and almost simultaneously in German and in English: Seven years in South Africa; travels, researches, and hunting adventures, between the diamond-fields and the Zambesi, 1872-79 (London: 1881). The book was an immediate success. With the Austrian ornithologist August von Pelzeln* as co-author he wrote Beitraege zur Ornithologie Suedafrikas... (Vienna, 1882, which has been described as one of the most interesting books on South African ornithology of the nineteenth century (Spohr, 1979, p. 37). With M. Neumayr he wrote a paper, "Ueber einige Fossilien aus der Uitenhage-Formation in Sued-Afrika", which appeared in the Denkschriften der Matematisch-Naturwissenschaftlichen Classe der Kaiserlichen Akademie der Wissenschaften in 1881. It contained descriptions of new species of fossils from the Uitenhage Group, which Neumayr concluded to be of Cretaceous age. In further papers and monographs he described some of the indigenous cultures with which he had come into contact. In particular, Eine Kulturskizze des Marutse-Mabunda Reichs, published by the Geographische Gesellschaft, Vienna, in 1879, was an excellent study. A more comprehensive overview, "The central South African tribes from the south coast to the Zambezi", was published in the Journal of the Anthropological Institute (1880). This paper included a brief description of kitchen middens which he saw along the south coast and which he recognised as remains left by prehistoric people. During this time Holub was making preparations for a second expedition to Africa, planning to traverse the length of the continent from Cape Town to Cairo. In November 1883 he married Rosa Hoff, who accompanied him. Upon his arrival in South Africa he presented a valuable collection of European fossils, mainly from the tertiary rocks of north-western Bohemia, to the Albany Museum, Grahamstown. His well-equipped exdedition, which included six noncommissioned officers from the Austro-Hungarian Ambulance Corps as assistants, travelled via Colesberg and Zeerust to Shoshong. Along the way Holub acquired some 140 specimens of rock art, mainly petroglyphs. His removal of these irreplaceable cultural artefacts to Europe has led some modern commentators to describe him as one of the pillagers of the nineteenth century in South Africa (Rudner, 1982, p. 435). Years after his death an illustrated publication, Felsgravierungen der suedafrikanischen Buschmaenner, auf Grund der von Dr. Emil Holub mitgebrachten Originale und Kopien (Leipzig, 1925), by J.V. Zelazko, was based on this material. North of the Makgadikadi Pan he lost more than half of his oxen as a result of drought and plant poisoning. At Mpandamatenga, on the present Botswana-Zimbabwe border, a trader told him that King Sepopo had died and that it was unwise to travel further. Holub decided to continue, however, and went on to explore the Zambesi around the Victoria Falls. But problems soon arose. His European assistants fell ill with malaria and two of them died. In July 1886, having just crossed the Kafue River in central Zambia, most of his porters deserted and while he and his wife were absent from their camp local warriors attacked it and destroyed his collections, instruments and more than half of his 32 journals. Holub and his wife, with the remaining two Austrians, struggled back to Kazungula, near the confluence of the Chobe and the Zambezi, suffering many hardships. There Holub spent some time hunting and collecting, returning to Kimberley around June 1887. Despite his misfortune he managed to acquire enough specimens to fill 130 cases, including a huge ethnographic collection. He left for Europe in August 1887. A two volume account of this second expedition was published in German under the title Von der Capstadt ins Land der Maschukulumbe. Reisen im suedlichen Afrika in den Jahren 1883-1887 (Vienna, 1890). It included one of the first descriptions of the region that now forms the south-western part of Zambia, and described the people living there. He later also wrote a number of popular articles for the American Illustrated Christian World (1896-1897), describing the South African diamond and gold fields and the geological formations and fossils of the Karoo. Again he gave numerous public lectures - over 300 between 1887 and 1891 - and exhibited his collections in Vienna (1891) and in Prague (1892). A portfolio of 22 photographs of indigenous people of southern Africa, titled Dr Emil Holub's Suedafrikanische Ausstellung, was published in Prague in 1892. Holub declined to sell his collections to American buyers for a large sum and instead offered them free of charge to the National Museum in Prague to form the nucleus of a permanent Africa museum, but the offer was declined. Many of the specimens were then presented to museums, schools and other institutions all over Europe and the United States. In 1893 he presented a collection of coleoptera of the families Carabidae (ground beetles), Cicindelidae (tiger beetles) and Curculionidae (weevils, snout beetles) to the South African Museum, of which 18 species were new to its collections. Some of his best material went to the National Museum in Prague, while most of the ethnological specimens, with his notebooks and drawings, are in the N?prstek Museum of Ethnology in Prague. Included among his papers are several beautifully drawn maps of the Transvaal and other parts of southern Africa. In 1894-1895 Holub undertook a successful lecture tour to the United States, and in 1896 lectured in Poland. He considered undertaking a third expedition to Africa, but the after-effects of malaria and other health problems prevented him from doing so. Holub was a traveller, rather than an explorer, and one of the most renowned and versatile collectors to visit southern Africa. His wide interests prevented him from making an in-depth study of a specific field, but he was an excellent observer and made significant contributions to natural history, medicine, hydrology and geology. As an ethnographer he set a new standard by giving detailed descriptions of tribal history, customs and ways of life and supplementing them by sketches of the people and their country and by accurate drawings of their artefacts. Many honours and decorations were bestowed upon him by scientific societies in England, Germany, France and Austria, but not in his home country Bohemia. He is commemorated in the names of the plant genus Holubia and several plant species, and in the names of some fish and animal species. His widow, who died in 1958 at the age of 93, left his notes and guns to a museum which was founded in his honour in his home town. Fock, G.J. Emil Holub (1847-1902), ein Afrikaforscher aus Boehmen. Journal, SWA Scientific Society, 1976/7, Vol. 31, pp. 99-109. Holub, Emil. Seven years in South Africa; travels, researches, and hunting adventures, between the diamond-fields and the Zambesi, 1972-79. Facsimile reproduction of the 1881 edition. Johannesburg: Africana Book Society, 1975. [Obituary]: Dr Emil Holub. The Geographical Journal, 1902, Vol. 19, p. 517. South African Philosophical Society. Transactions, 1877-1879, Vol. 1, p. iv and list of members.